For Viruscraft, we’re developing a new game and tangible interface to improve our understanding of how viruses evolve and infect new hosts. The project is in collaboration with Dr. Ben Longdon (University of Exeter) and is funded by the Wellcome Trust. In April 2017 we ran a workshop for craft professionals and virology/evolution researchers. 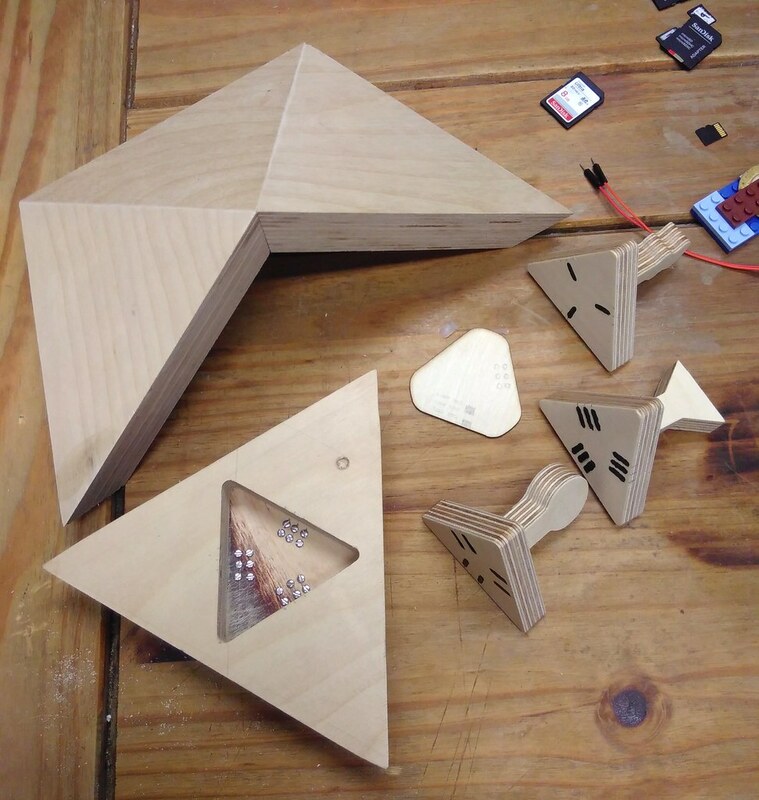 A great deal of inspiration for the Viruscraft project comes from the participants’ prototypes. This post is an update of developments since the workshop. 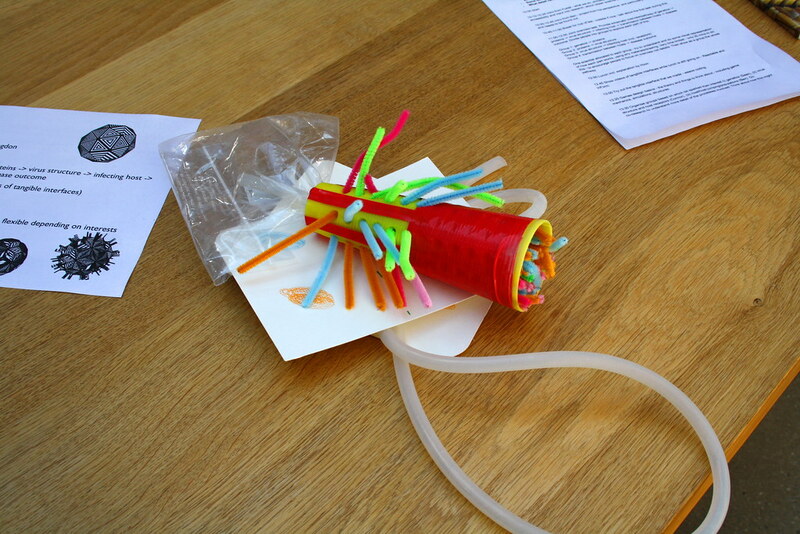 The structural elements of virology were an immediate hit at the Viruscraft workshop – whereas less tangible concepts like genetic trees were less interesting to people. Virus structure is quite geometrical, and it is the lock-and key structural fit with the host’s cells that either allow a virus to infect a host or not. The evolution of this structure is something that we are making explorable through a game and tangible interface. At the workshop, some participants made a simple colour matching game mimicking evolution of the genetic code of a virus – this prompted us to consider using a matching approach for Viruscraft, albeit with shape instead of colour. Viruses have a protein ‘capsid’ that contains their genome – this capsid is typically a geometric structure composed of repeat subunits. On the outside of the main structure are ‘ligands’ - these are essentially the keys that fit into the locks (‘receptors’) that are on the outside of the host’s cells. If the fit is good, the virus can infect the host’s cells - but if the host evolves to change the shape of its receptors, then the virus can no longer infect it without evolving the shape of its ligands – and so an arms race occurs between the host receptor shapes and the virus ligand shapes. A virus can potentially jump into a new host species if it can evolve to fit into the new host’s receptors. So, in a simplified sense, infection and the spread of disease really is about matching shapes – and this is the starting point for our work. Working with Aaron Moore at the St Agnes Makerspace, we’ve begun prototyping a virus structure that will be made from thick birch ply. The virus will be an icosohedron – made up of 20 identically sized triangles. 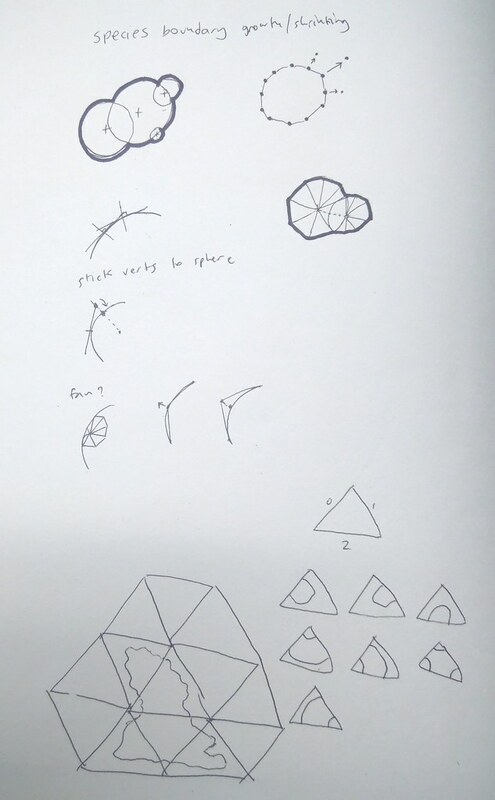 This is a realistic structure for a virus, and one that we can feasibly build (though Aaron assured me early on that ‘carpenters don’t use triangles for a reason’, so we anticipate difficulties!). The structure of each triangle has to be as in the image below in order to make a hollow icosohedral virus which is strong enough to withstand museum crowds. 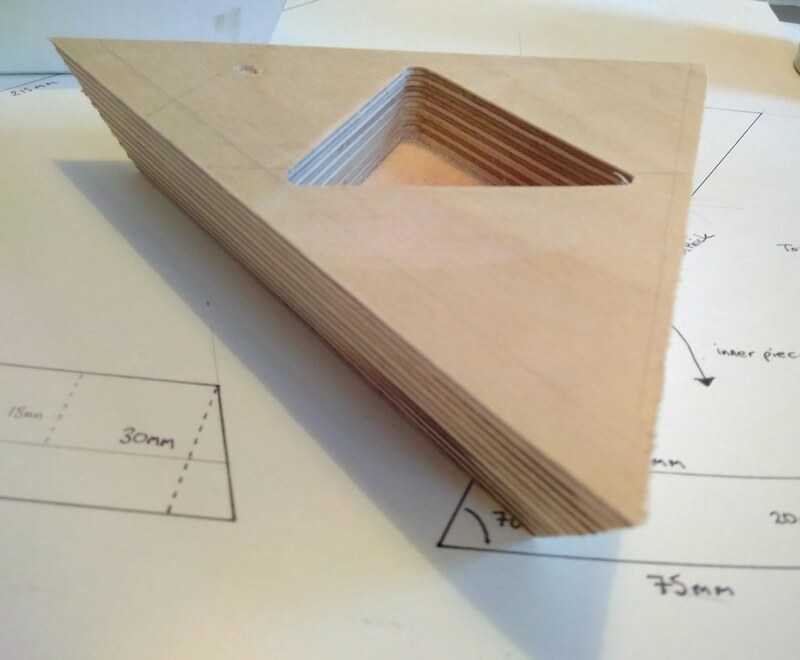 The triangles were cut using a table saw set to approximately the correct angle, but we may buy custom-made CNC router cutters to cut these shapes more accurately to ensure all the joints fit perfectly. 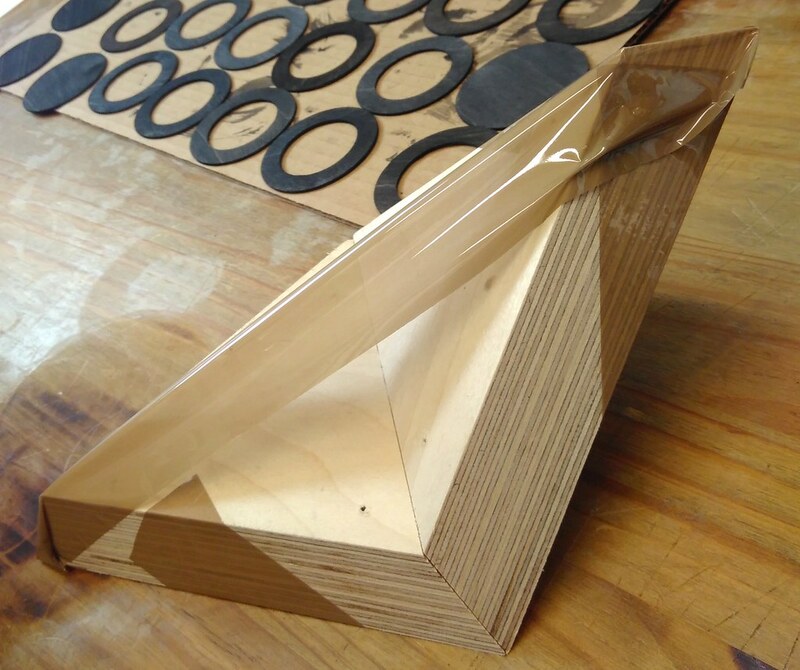 Using a clever trick with tape, the triangles can be attached to each other with wood glue, forming a bond stronger than the wood itself. 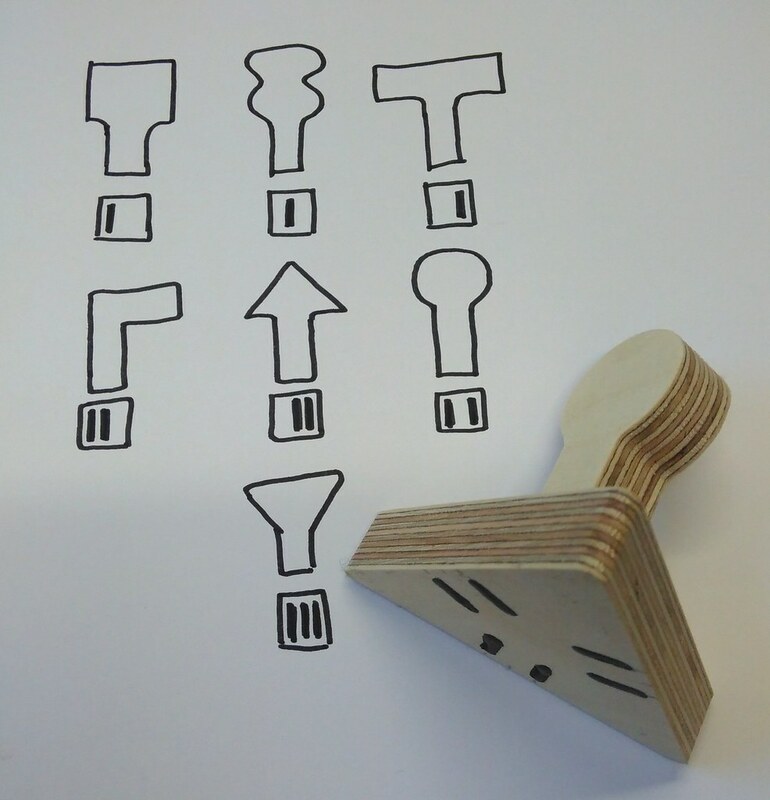 Some of the triangles will have smaller internal triangles cut out of them using a CNC machine – this is to allow interchangable ligand pieces to be inserted. We’ve designed 7 different ligand shapes that can be plugged into the main virus – players will be able to evolve their virus by changing the ligands on the surface of the virus. The main virus structure will contain the electronics in its hollow inside space, and will split into two pieces to allow access to the inside (we haven’t figured out the joining method just yet, but it’s probably another application for the magnets that we seem to use in everything these days). The identity of the shapes that are plugged into the main virus will be detected automatically. To do this, each hole in the virus structure will have 6 pins, arranged in 3 pairs. If the pairs of pins are connected, a current will flow. Each ligand shape will have a pattern of metal strips that will connect either 1,2 or 3 pairs of pins on the main virus. This is a new approach for us, and it all contributes to FoAM’s research and development in tangible programming interface design. We still need to prototype the electronics to make sure we have components that can withstand a lot of bashing about – but the ideas are now all in place to start building in earnest in the new year. The tangible interface will control a screen-based, or possibly spherically projected game world. We’ve been working on getting a simplified online version together, so we can test out some of the parameters. Various prototypes are available to play with here. 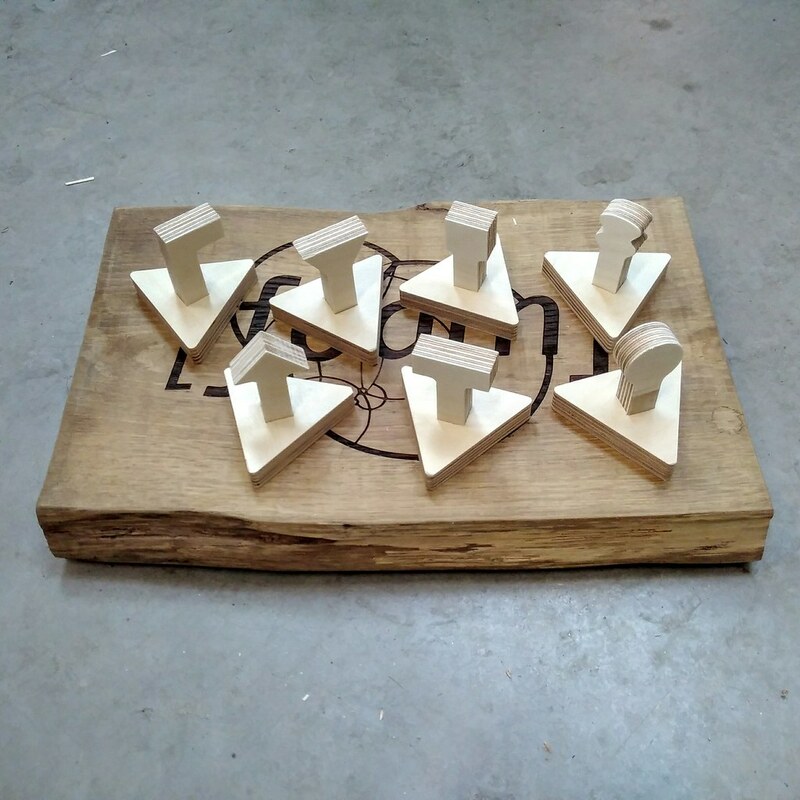 In the Crafting Prototype there is a virus shape much like the wood interface that we are building, with some shapes that can be added to the outside. 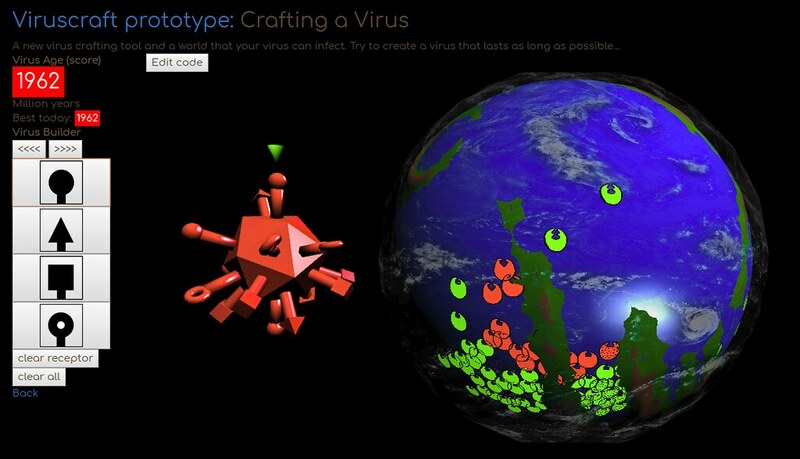 The hosts inhabit a world, and each host has a corresponding shape that your virus can be made to fit into. Your job as a virus is to infect hosts and stay alive as long as you can. If you specialise too much, infecting only one type of host, you may kill off your host and die along with it. You can jump to a different host by changing the shapes on your virus. The optimal strategy is to be a shape-shifting generalist that doesn’t wipe its hosts out. We’re building on the Crafting Prototype to add in different ecosystems that contain different hosts – some aerial, some terrestrial, and some aquatic. We're currently changing the globe so that it is made from a series of triangular subunits to make it possible to confine species to different ecosystems more easily. Some other possibilities include allowing players to set the host diversity at the start. Low host diversity means that it is easy to infect a lot of individuals, but the chance of wiping them out is also very high – there’s an obvious message here that diversity is critical for survival when a species is faced with infectious diseases. We may also add in random environmental events like extinctions caused by asteroids or sea level rise caused by climate change. We’re planning a workshop in early 2018 for people to try out what we’ve made and hopefully give feedback that will make the project better. If you want to be kept in the loop about this and other upcoming workshops, you can join the events mailing list for the FoAM Kernow studio here.